The effect of a good drawing is sometimes ruined by lack of thought. The placing of the picture in the shape of your paper for instance is most important. Details should not detract from the main object of interest. 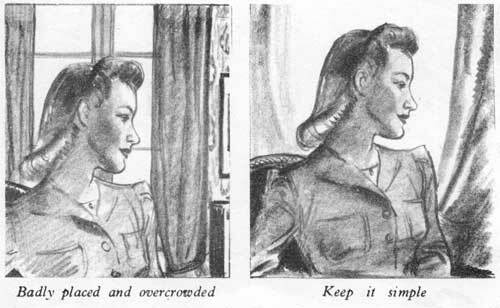 The figure should make a pleasing silhouette and anything introduced, such as drapery, should help in the balancing and rhythm of the composition. 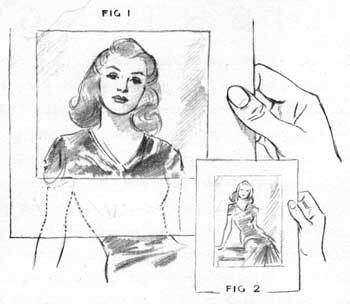 The simplest method by which you can judge where to place your drawing on the pad, is to cut out a rectangular hole in the piece of paper, the same proportionate shape as your pad, then hold it up in front of the sitter so that you can look through as in figure (1) and (2). You will be able to adjust the amount of figure you want to put in by moving the rectangle closer to or further away from your eye. You can also turn it on its side if necessary.